Blame it on political instability or the 2007 financial crisis. Trust in political and social institutions is eroding, and businesses are increasingly expected to play a bigger role in addressing social issues. In January, BlackRock chief executive Laurence D. Fink wrote in a letter addressing business leaders that companies must not only deliver financial performance, but also make positive contributions to society. Clocking in at more than 100 pages, the report is both fascinating and hefty. Deloitte researchers surveyed more than 11,000 business and HR leaders around the world, many of whom believe that successful organizations will need to move away from a siloed operating model to a more collaborative one, as well as increase engagement with external actors. Spend Matters will cover the report’s main findings over a series of three posts. Today’s post will cover the first three aforementioned trends. Post 2 will discuss the evolving concept of the career and the expectation for businesses to assume leadership roles in society, and Post 3 will cover the effect of disruptive technologies on work and businesses. While 85% of the professionals surveyed said that it is important for members of the C-suite to break out of their siloes and work as a team, only 46% thought that most organizations’ C-suites are ready to do so. 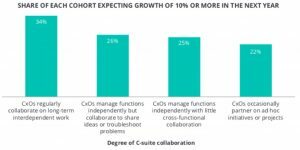 Moreover, around three-quarters of respondents reported that their C-suite leaders rarely or never collaborate on projects or strategic initiatives. But as the chart below shows, more collaborative C-suite leadership styles are correlated with higher expectation of growth. The Deloitte report argues that organizations need to aspire to having a “symphonic C-suite” — a model where members of the C-suite collaborate on furthering the organization’s strategic goals and inspire networks of teams throughout the organization. “The goal is a symphony of specialized experts playing in harmony — instead of a cacophony of experts who sound great alone, but not together,” the authors write. To get started, the report suggests that CEOs review the positions and priorities of each C-suite member to determine how he or she can contribute more broadly to the organization. Next come cross-disciplinary projects that allow C-suite members to align their goals and efforts. Last but not least, these projects need to be visible within the organization so as to foster a culture of collaboration. Regular readers of Spend Matters know that the contingent workforce is a topic that we cover regularly (in large part thanks to Andrew Karpie, our resident expert on services and labor procurement). And so it likely comes as no surprise that businesses are increasingly relying on contractors, freelancers and gig workers. Only 42% of the survey respondents say that the workforce at their organization is primarily composed of salaried employees. A third of the respondents anticipate that their organization will increase its use of freelance labor by 2020, and 37% expect the use of contractors to increase. The market of software for managing non-traditional workers is growing fast, but still limited. Forty-two percent of the respondents worry that using contractors can put confidential information at risk, and 36% believe that there could be a reputational risk to the company. Non-traditional workforces can be less stable, and there is also the risk of running afoul of government regulations. The report gives a number of recommendations for dealing with these challenges. One is to bring talent management to the greater organization by encouraging HR teams to collaborate with legal and IT departments. HR also needs to be more involved in finding non-traditional workers and provide them with onboarding and development opportunities. The report argues that the rewards programs at companies today are no longer in line with employee preferences. While 91% of companies conduct salary reviews once a year at the most, a study by Globoforce has shown that employees are eight times more engaged when they receive small rewards more frequently throughout the year than when they receive salary bumps or bonuses once a year.